Growing up we had only one favorite restaurant where we loved to eat. It was at a tiny bar in a small town near my small town that served “Mexican” food (this was before there were any Hispanic population in town). It was always poorly lit and cloudy with smoke, you always had to wait for a table (and there was no waiting area), and people were packed in there like sardines. But you got baskets of fresh tortilla chips with their hot, hot, HOT homemade salsa, the nachos were loaded up with cheddar cheese and jalapenos, and we (my sister, brother, and I) were able to order a pitcher of Diet Coke. I loved everything about it. I still do, the location has changed, and of course, there is no more smoking, but their food is still good if even only for nostalgic reasons. Their tacos were made with a soft finely minced ground beef and subtly seasoned. I loved it. It was nothing like the browned ground beef that was seasoned with the premixed salty seasoning packets from the grocery store that we usually had for taco night. I think I have found the secret to this Mexican ground beef. It might sound a little crazy, but you boil it instead of browning it. This is what makes it so soft and fine. Mmmmm. There is a little preplanning that needs to occur when you cook your ground beef this way since it takes an hour to cook. Good things come to those that wait, right? We enjoyed this Mexican ground beef for dinner in crispy, crunchy taco shells. 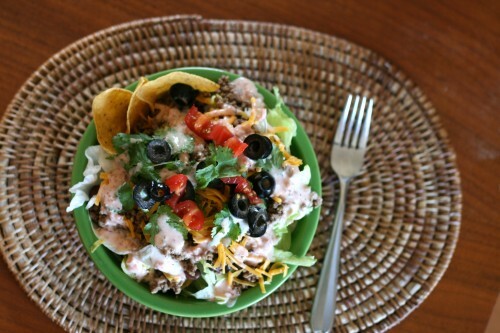 The next day I warmed up the leftover meat slightly and had it on top of lettuce for a delicious taco salad. Use it where ever you’d use ground beef. The bonus is you know exactly what ingredients are in the seasonings so you are guaranteed to have gluten free seasoned taco meat! 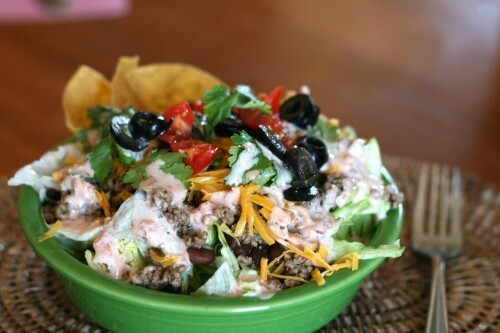 Iceberg lettuce, leftover Mexican ground beef, black beans, shredded cheddar cheese, cilantro, black olives, chopped grape tomatoes, 1 tablespoon lite Ranch mixed with 1 tablespoon Melina’s salsa I also had some Melina’s tortilla chips for added crunch. If you are feeling really crazy I recommend crushing up some Nacho Cheese Doritos and sprinkling over your salad. Crazy, I know. Strain away any leftover liquid. If you are making this ahead of time you can place the leftover liquid in the fridge to harden the grease. Spoon off any hardened grease and add a little liquid back to the meat if you are reheating it. When reheating in a slow cooker add in a 1/2 cup of beef broth to keep the meat moist. I wanted to let you know I made this earlier this week and it was delicious. Going to make tacos this way all the time. I wonder if you used ground turkey would it end up the same? Does it taste like the mexican restaurants style? IMO it takes very authentic. I moved to TX a year ago and after eating real deal Mexican cuisine, I wondered why my meat was never quite as tasty. I googled “Mexican ground beef” and found quite a few recipes but decided to try this one and I’m soooo glad I did. Now it’s my go-to seasoning mix whenever I make anything remotely Mexican. The kids love it and any taco packets I have in my cabinet are probably stale. Lol. Not sure about the comments on browning 1st; I just add broth to the I browned meat. Turns out great every time! Does boiling not take the grease out of the meat? When I fry hamburger I dip out the grease as I am frying it. Diane, boiling does remove the grease from the meat and you can strain it away once it is done cooking. This is how I do it if I use it immediately. If I am making it ahead of time (for a taco party or something) I will refrigerate the strained liquid, spoon off the hardened grease, and add some of the liquid back to the meat to help keep it moist in the crockpot. What fat to meat ratio do you use? Great question! I usually use 85% lean when cooking meat this way. I finally found a go to recipe for taco meat! It is delicious and can be made for many different mexican recipes. I’ll never buy the packaged stuff again. My husband normally doesn’t like tacos but he loves them made this way. Oh such great news Carolyn! Thank you. I cook my meat this way several times a month. Has anyone ever done this recipe in the crockpot? If so how did it turn out? I have not tried it in the crock pot before. I am not sure if the meat would be broken down as finely as it does on the stove. If you try it please let me know. Cooked it in the crockpot all day on low. Used a potato masher to break the meat up and it turned out perfect!!! 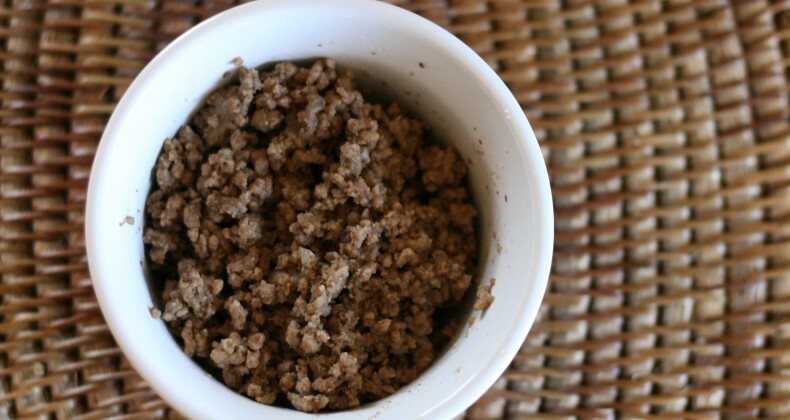 The family loves this taco meat instead of using store bought seasoning! Thanks for the follow-up Karen! It is a family favorite in my house too. Just a heads up. The meat is first browned, then boiled in a small amount of water. I did not know that. Thanks for the comment, Zoe. I agree, fry it, drain it, season it, sprinkle with flour.stir it, fry till sizzles Then add just enough water or broth to barely cover. Bring to a boil and reduce heat to low and let it simmer down. Just need to clarify the comment about browning the ground beef before adding the broth. Is this for the crock pot method only or the traditional skillet method as well? HI Lynda! I have never browned the ground beef before adding the broth. I always just add the broth to the raw beef and boil it that way. A reader had commented that she browns the meat then adds the liquid. I can not verify you will have the same end result as the recipe as written. hi Lynda, that’s for the regular stove top method. However I also make a more gourmet version which I add fresh diced sauteed onions, tomato (not sauteed), peppers, green pepper and cilantro (not sauteed) and of course my spices and broth that I cook in a covered dish in the oven (remove the cover for the last 10 minutes). I always start out with browned & drained ground beef though. I love using vegetable broth for this. I’ve also used one of the very small single serving cans of Snappy Tom with chicken broth before. It was a substitution but oh man did it turn out good. My friend saves corn cobs when they have corn on the cob and simmers one in hers. While you can’t taste the cob something about it makes the flavors really pop. I’m gonna make taco burgers with this taco meat tonight, yummy!!!!! I made this tonight. So yummy! Thanks for sharing! I am so glad you enjoy it. Thank you for letting me know! Is there any faster way to cook the meat? Sometimes I don’t have 1 hour. Tacos are suppose to be quick. Love the flavor. This is one of those “good things come to those who wait” type recipes. The quickest tacos are made by browning the meat but you aren’t going to achieve the same texture as the boiling method. Many thanks ! ! !